Wild Berry, in its 5 Reels version, will ofer you a modern design and layout, with extra features, but the graphics remain largely the same, many of the symbols from the classic title being found in this one as well, in exactly the same form. The game’s theme is inspired by nature, with its various types of wild berries and even a couple of insects that are going to be found nearby. The game was designed by the developers from Saucify. There are no less than 50 lines that can be used in this game, 5 reels being sufficient to hold them all. 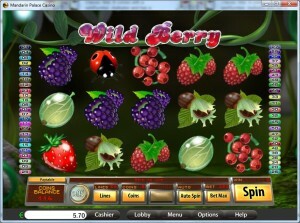 The features include the scatter symbols, wilds, multipliers and the free spins. As for the big prize, it’s at $12,500. 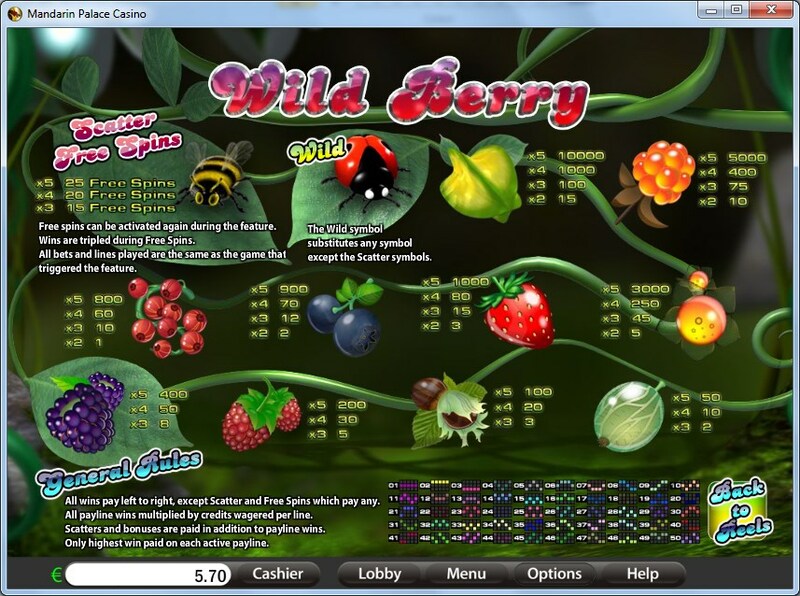 Among the Wild Berry features you will discover the wild Ladybug, the scattered Bee and the free spins with 3x multipliers that it can bring you. First, let’s look at what the Ladybug wild can do for you. This symbol is going to appear anywhere, and take the place of any other symbol that is needed, but it will not give you any prizes of its own. It can’t form its own combo, but get it in the right spot and you will see it take the role of another icon, as long as it’s not a scatter that you need. The Bee symbol is the other one with an extra role in this game. 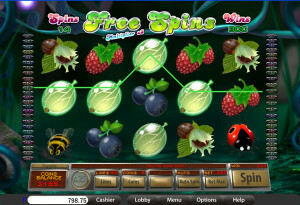 It doesn’t form regular combinations, being used as a scatter instead and triggering free spins by being in at least three locations on the reels. 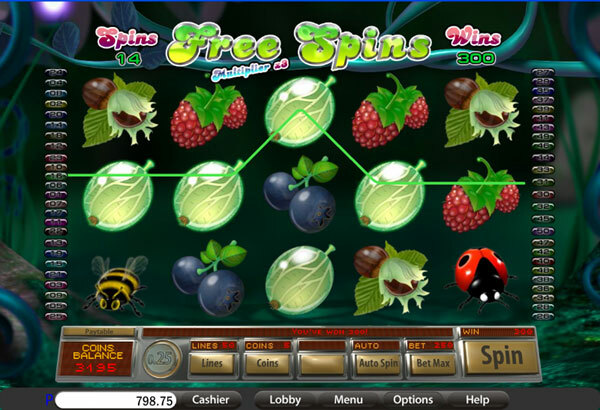 The locations can be random ones, and they will bring you 15, 20 or 25 free spins, depending on how many Bees are present (3, 4 or 5). The wins you get during the free spins are tripled in value. You are also allowed to retrigger the free spins. The bets you get to place here are fairly typical for a game from Saucify. They use up to 5 coins per line, while denominations are in the $0.01 to $0.25 range. That gives you a maximum line bet of $1.25, while for all 50 lines the total is at $62.50. The game is a lot more generous than you might expect since it has so many lines. It offers a 10,000x jackpot, whose value would be up to $12,500. As I’ve said, the design has stayed largely the same as the one from the 3 reel title. The same forest environment is visible all around the reels, while on them you get either various types of wild berries or you have a couple of insects which are used to trigger the features that are available. 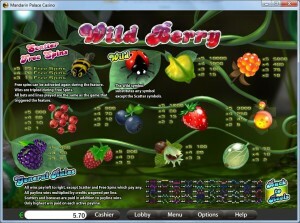 The quality is better than you’d expect from a slot with fruits as its symbols, and I’m sure you will enjoy playing it. Symbols: Ladybug (wild), Bee (scatter), Star Fruit (10,000x), Sea Buckthorns (5,000x), Hackberry (3,000x), Strawberry (1,000x), Blueberry (900x), Currant (800x), Blackberry (400x), Raspberry (200x), Ribes (100x) and Gooseberry (50x). When you look at the high number of lines (50), at the prizes it offers (up to 10,000x), the design and the list of features, you have no choice but to give this slot a chance. 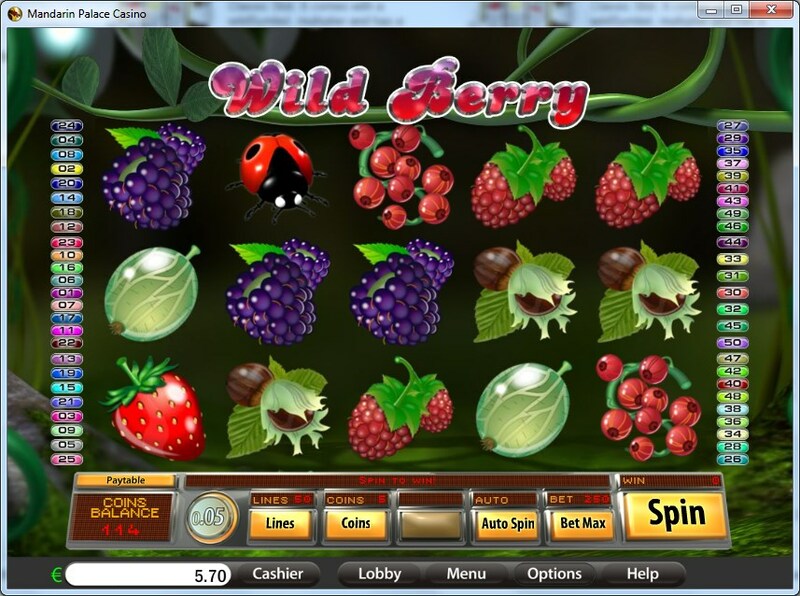 This Wild Berry – 5 Reels slot is offered by all online casinos with Saucify/BetOnSoft software, playable either in practice or in real money mode.